Turkish Prime Minister Binali Yildirim said Saturday that Russia could possibly use country’s southern Incirlik Air Base if it becomes necessary. At the same time Yildirim added that there were no need in Moscow’s use of the base, because Russia possessed facilities located in Syria that was not far from Incirlik. “This information is not correct, but if necessary the Incirlik base could be used,” Yildirim told reporters, answering a question about Moscow’s alleged request for use of the base, as quoted by the Turkish Anadolu news agency. Russia has been conducting an aerial campaign against terrorists in Syria since September 30, 2015 at President Bashar Assad’s request. The majority of operations is conducted from Russian air base Hmeimim in Syria, while country’s Aerospace Forces are also conducting sorties from Russia and from Iran’s Hamadan base. Turkish officials closed the airspace to complete “anti-coup” operations at the base, where some of the servicemen are suspected of supporting the failed Friday night military coup. Turkish officials have rounded up over 2,800 soldiers as well as at least 2,745 judges who they claim were sympathetic to the coup. Those individuals will now face prosecution for treason. The presence of the US nuclear weapons arsenal in Incirlik Air Base was further complicated on Saturday when Turkish Labor Minister Süleyman Soylu alleged that the United States was behind the failed coup attempt. US Secretary of State John Kerry issued a fierce condemnation of the allegations calling them harmful to bilitaral relations between the two countries, a sign of a potentially brewing diplomatic row between the two long-time NATO allies. Turkey is ready to cooperate with Russia on the fight against the Islamic State terrorist group, but there are no talks on using the Incirlik airbase, Turkish Foreign Minister Mevlut Cavusoglu said Monday. The Kremlin found out about about Turkey’s proposal regarding the Incirlik airbase through the media and Moscow will need to analyze this “important statement,” Kremlin spokesman Dmitry Peskov also said Monday. “I didn’t say that, I was referring to renewed cooperation with Russia on Syria,” Cavusoglu said as quoted by CNN Turk, clarifying his earlier statements. The Incirlik base is five miles north of the Turkish city of Adana near the Syrian border.The airbase currently hosts aircraft of the United States, Germany, the United Kingdom, Saudi Arabia and Qatar involved in the US-led air campaign against Daesh, which is outlawed in several states, including Russia. Earlier, Russia and Turkey have reached common understanding on the Syrian crisis, including fighting al-Nusra Front militants. During a meeting with Russian Foreign Minister Sergei Lavrov, his Turkish counterpart Mevlut Cavusoglu said that Ankara considers not only Daesh but also al-Nusra Front as terrorists. Kremlin spokesman stated that Kremlin found out about about Turkey’s proposal regarding the Incirlik airbase through the media. 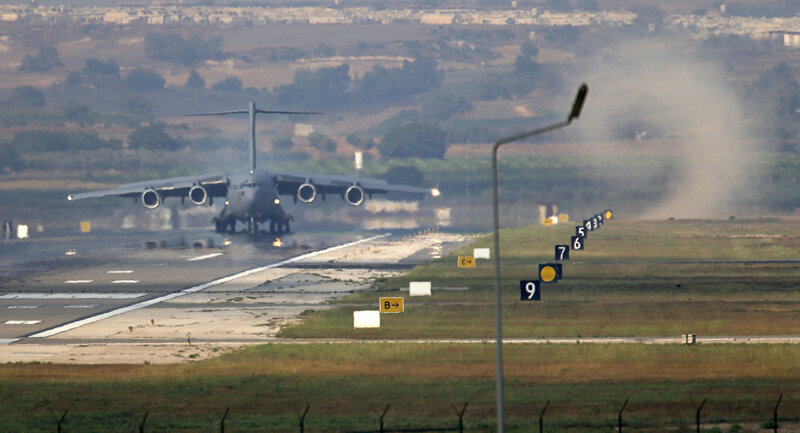 The Kremlin found out about about Turkey’s proposal regarding the Incirlik airbase through the media and Moscow will need to analyze this “important statement,” Kremlin spokesman Dmitry Peskov said Monday. “I don’t know if there have been any official military talks on this matter, whether they’ve had time to resume them. If I’m not mistaken, they have not. We really did hear this statement for the first time through the media. Of course, this is an important statement and it will need to be analyzed both politically and militarily,” Peskov told reporters. Turkish Foreign Minister Mevlut Cavusoglu told local television earlier in the day that Ankara could allow Moscow to use the Incirlik military airbase in southern Turkey in its fight against the Daesh. According to the Turkish Foreign Finister, Russia might be allowed to use Incirlik Air Base. Cavusoglu noted that Ankara could allow Russia to use the base to fight Daesh in the region.